Easyfundraising - Help raise funds for Confirmation just by shopping online (you don't pay anything extra) £180.48 raised so far. Just wanted to say a BIG thank you to everyone who helped us in any way with the Confirmation and First Communion celebrations! 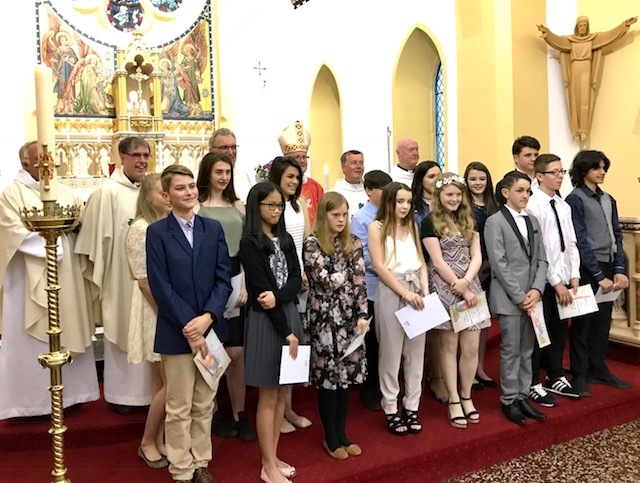 It was lovely to see our young people being confirmed by the Bishop and fully participating in a wonderful service. We are very grateful to Heather for all the help, Sue and the choir for the music and for boosting the singing. We did have a bit of moment when Fr Andrew said that all the Mass should be sung; he did settle for just the Alleluia though! We were also very pleased that so many, including the Bishop and priests, joined us afterwards for refreshments; a well-deserved thank you to the social committee for their help with the refreshments (it did get a bit hectic at times!). A big thank you also to all of our young catechists who have given up so much of their time and have been such a big help to us in planning and delivering the programme. We truly are blessed to have them! Thankfully, everything went quite smoothly for the First Communions and it was lovely to see the church so full! The children were lovely and did really well throughout the service. Again, a big thanks to Heather for all the advice and help, Sue for playing the organ (and being so quick on the uptake when I forgot the sung Our Father! ), the choir, Eucharistic Ministers, Social Committee for again providing the refreshments, Parish Council members and those that helped in setting up and clearing down. Thank you also to Fr Dennis for his help, understanding and ongoing support throughout both programmes. We were very pleased how everything turned out and have to admit that we are grateful that we can relax now until it all starts again next January! Needless to say, if anyone is interested (or you know anyone who might be interested) in joining us a catechist, please let us know! Here in St Anne’s, through careful planning of sessions and Pre-Confirmation weekend at the Briars, we provide an interactive Confirmation programme that is very much candidate led e.g. discussion, games, stories, film clips, music, poetry and activities such as baking bread to illustrate child poverty across the world and interviews with a ‘modern day’ Jesus. It is a journey of self-discovery through which we hope to expand the candidates’ understanding of their faith and its application in life today, especially through prayer, service to others and commitment to ‘justice, peace and compassion’. “How beautiful it would be if each of you, every evening, could say: Today at school, at home, at work, guided by God, I showed a sign of love towards one of my friends, my parents, an older person….” (The words of Pope Francis during a recent Eucharistic Celebration that was dedicated to 44 young people from around the world to whom the Pope imparted the sacrament of Confirmation). Our hope for the candidates is for them to become full members of our Church and it is only by bringing the Gospel to them, on their terms, that we will be successful. We have no illusions that we will keep every newly confirmed young person, but the small splash we make will hopefully make a few ripples! Our sessions will, we hope, touch and enrich their lives to help them be a part of God’s kingdom here on earth today, and we endeavour to reinforce this in every session. We must strive to be a community that draws in young people, and gives them a sense of belonging, of finding a home in our church and being given opportunities to show their worth. We need to build and develop relationships with young people and encourage them to ask questions; we must make a journey of faith together, respecting each other and hoping that by our catechesis we can make a difference in their lives. As a Confirmation team we can assist this through prayer and leading by example; it is important however, that we all continue to reach out to young people as without them there will be not be a church. “You should pass on the flame of faith. However Jesus did not say this was an option but simply ‘Go and make disciples of all nations’. This is the command that the Lord entrusts to the whole Church and that includes you”. Copyright St Annes Catholic Church BUXTON 2019©. All Rights Reserved.